Has anyone else tried multiple servos moving at once? I'm curious how other systems will perform in terms of power supply capability required to get smooth motion. Hey @ogiewon. I had a question for you regarding the PS_Voltage. I'm getting ready to build my own sensor for my drywer using a split core transistor. I have one that reports only up to 1v and also is below 100 mA when reading 20A and since I'll only be reading one of the two hot wires to my electric dryer, I figured that would be less than 20 since each circuit is 15A. My question is about the constructor in the Hubduino sketch. The s_l,s_h,m_l,m_h are a bit confusing to me. I assume that the s_l and s_h are the low and high of the raw reading but what is the range of that normally? And I assume the m_l and m_h are the mapped low and high? Is one analog reading enough to be accurate or should I take 2 or 3? Any tips you might have would be very welcome. In fact, that was the constructor I was planning on using, at least at first. I don't know if the 60 seconds is too aggressive. I used 1023 because that's what was in your example. Will both readings or only the mapped one come out in the serial log? Again, any times would be very welcome. Thank you! The 0 to 1023 comes from the analog to digital converter on your micro controller. If you’re using a 10 bit ADC, then 0 to 1023 (or maybe 1024, actually) would be appropriate. Whereas a 12bit ADC would be 0 to 4096. I think every 30 seconds should be fine. For a current transformer on an AC circuit, you’re going to have to deal with zero crossings where the voltage goes to zero 120 times a second. If you only sample once or twice, you may get erroneous readings. I would set the number of readings to at least 10 and see what you get. You can also use the filterConstant to help prevent a single low reading from messing up the result. I would probably set it to 80 as a starting point. I'm using a Wemos D1 Mini which I'm 99.9% sure has a 10bit ADC. Thanks for all the info! I will definitely give it a try. You're the best!! @ogiewon 10 bit ADC will return 1023 as the highest digital value which equates to 1111111111 binary. 12 bit ADC will return 4095 as the maximum digital value. While technically not correct, using 1024 instead of 1023 in the mapping function will not cause enough error to be noticed in most applications. @Ryan780 using the value 20 is probably not the correct value to use for m_h depending on Aref for your microcontroller. If you reply with which microcontroller board you are using, I can assist in determining the correct mapping values. It would also help if you could send a link for the current sensor you plan to use. Wemos D1 mini is 10 bit, so s_h = 1023 is correct. If your sensor outputs 1.0 volts at 20 amps input, m_h = 66 would be appropriate for a Wemos D1 mini. Here's why: A0 input range on the Wemos D1 mini is 0-3.3 volts. It has a voltage divider that scales 3.3 volts down to 1.0 volt at the input pin of the ESP8266. The ESP8266 will read a digital value of 1023 for a 1.0 volt input. Including scaling the effect of the voltage divider will give 1023 for a 3.3 volt input at A0 of the Wemos D1 mini. Your sensor's maximum input voltage to A0 is 1.0 volt, so some scaling is required. Some things to note: You will only be using 1/3.3 = 30% of the ADC range at 20 amps input. The corresponding digital value will be 310. The precision (step size) you will see for the device in Hubitat is 20/310 = 0.065 amps. PS. I'm curious about the current sensor you are building, especially the comment about 100 mA when reading 20A. Can you tell me more about the sensor? I want to be sure I am giving you good guidance on the scaling factors. Wait.... What? What does 3.3 v have to do with anything. LOL. Now I'm so confused. What are you talking about? The Wemos D1 mini A0 input voltage range is 0 volts to 3.3volts. 0 volts input will result in ADC conversion to 0 digital value. 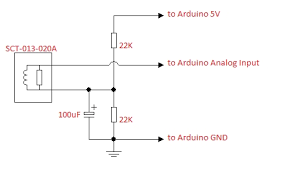 3.3 volts input will result in ADC conversion to 1023 digital value. Okay. So, why wouldn't I just use 341 for my s_l? Also, this is the transformer I got. What output units would you like to send to Hubitat? Volts, Amps, or Watts? If using the Energy child device, I would think Watts or kW would be appropriate. Your CT will produce 1 volt at 20 amps. Since the Wemos input allows for up to 3.3v, the maximum reading at 3.3v would be 66 amps. 66 amps * 240 volts = 15840 Watts. Might as well be as accurate as possible, right? Okay. Ill give that a shot. Increase it until the output becomes consistent. So, why wouldn't I just use 341 for my s_l? Well, that's when it is important to tell the community what you are trying to do, and what hardware you are doing it with. Most times you will get an answer on what to do even if you don't understand. If you have the need to understand, keep asking questions. BTW, I found a spec sheet for the current sensor you are using, and I believe the two options we gave you are correct for that sensor. Replace the Arduino 5V with your Wemos 3.3V. The resistor and component values should still be ok as shown. I'm too tired to calculate the scaling factors to use, but they will likely be different than we gave you previously. I can think about this again tomorrow. Why would it output - 1v? I'm only going to be attaching it around 1 of the hot lines of the 220v. The current will only ever be positive. So, why would the voltage be negative? It says that the output is 0-1v. So it will be a sine wave that is positive and negative. I would recommend the circuit proposed too. I have used some micros where the have internal diodes to protect against negative voltage/current but they can't handle much, so it is better to be safe than sorry. I wouldn't need a burden resistor? Is that the same as the "sampling resistor"? Also, would a 1000uF 6v capacitor work or no? I really don't want to have to buy a whole other set of capacitors. Also, the other pages I've looked at call for a 10K resistor instead of 22K. Is there a reason to use one or the other? The SCT-013-020 already has an internal burden resistor, as shown in the diagram posted by Jeff (@VooDooFiveTwo) above. So, no need for an external burden resistor. The goal of the circuit above is to act as a voltage level shifter, by biasing the voltage by 50% of the Wemos 3.3vdc supply. So, instead of the output of the CT varying from -1v to +1v, it will instead vary from ~0.65v to 2.65v for a full 20A load. for a 10A load, the voltage would vary between 1.15v to 2.15v. So, that now leads us to the next issue... How do we calculate the current from an oscillating signal? I am enjoying the discussion regarding this subject. 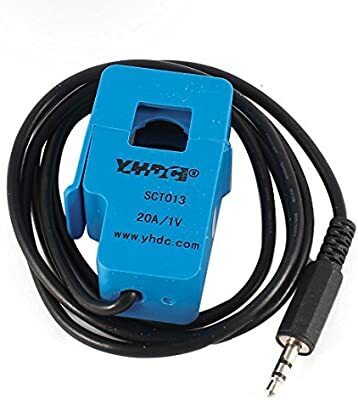 I can imagine a new ST_Anything device being written that would be able to read the current value from a CT, and convert it to power (P = V * I, where the user would provide the voltage in the constructor as either 120VAC or 240VAC, for example). This would then be sent to to the Power Device (Watts or kW). We could also expand it to include some options for Energy as well, which is in kWh typically. This will never be an incredibly accurate measurement of power/energy, but it wouldn't be too far off. First of all, I don't expect the load to be any higher than 10A for the one hot line. So, is 1.15-2.15 enough variance to accurately measure that? Wouldn't I want a greater spread in the values?